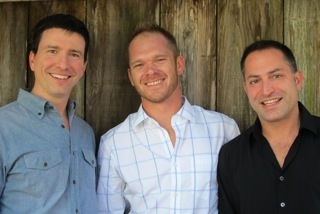 Here’s the latest from the guys leading the charge to legalize Crowdfund Investing (CFI) in Washington, DC. Entrepreneur: Register to show how many people you need for your business (eg: jobs you will create) and the economic impact it will have. Investor: Register to show the impact your dollars will have stimulating our economy. 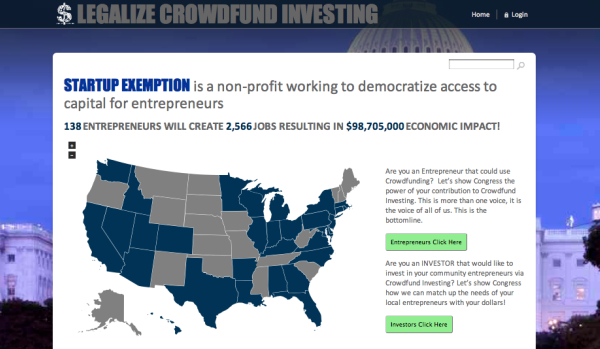 Crowdfunding Supporter: Send an email to your Legislators, Tweet and Post about the site! 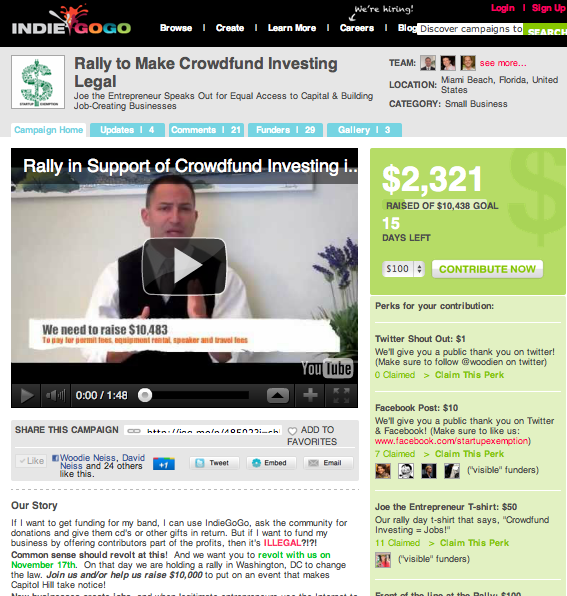 Endorse Crowdfund Investing! SBE Council plans to send this group letter to U.S. Senate Majority Leader Harry Reid (D-NV) and Minority Leader Mitch McConnell (R-KY) in the coming week. If you would like to sign onto the letter and add your name to the growing list of groups representing small business owners and entrepreneurs that are urging the U.S. Senate to take action, please send your name, affiliation and email contact information to SBE Council at info@sbecouncil.org. The Good: As it stands we have 3 bills before Congress. HR 2930 passed the House with an overwhelming 96% approval – Yes that’s true bipartisan support. President Obama came out and endorsed the Bill with a Statement of Administrative policy and also included our framework in the Startup America Legislative Agenda. Things have slowed down in the Senate but to help move things along we went back to Washington and presented them with some Commonsense Consensus ideas that pull the best of the 3 bills into one. The Bad: NASAA’s opposition to crowdfunding is also in opposition to the needs of our economy, entrepreneurship and jobs. NASAA argues that they are best suited to regulate simple, transparent markets for businesses on Crowdfunding Intermediaries. This would create 50 different markets for Crowdfunding, rendering Crowdfund Investing dead on arrival. This is part of the reason it is so hard for small businesses to raise money today; different bureaucratic, costly rules for each states. Since CFI is based on community financing, we believe the crowd can do a better, faster, cheaper and more efficient job of determining which ideas, if any, should be funded and with how many dollars. It is that simple. Leave the heavy-handed, traditional regulation and oversight for the larger businesses that can access traditional capital. We advocate state regulation preemption, while preserving the enforcement power of the states to pursue fraud when it occurs. friends at Laudsauce have launched a campaign to place a one-page ad on the back of Politico. 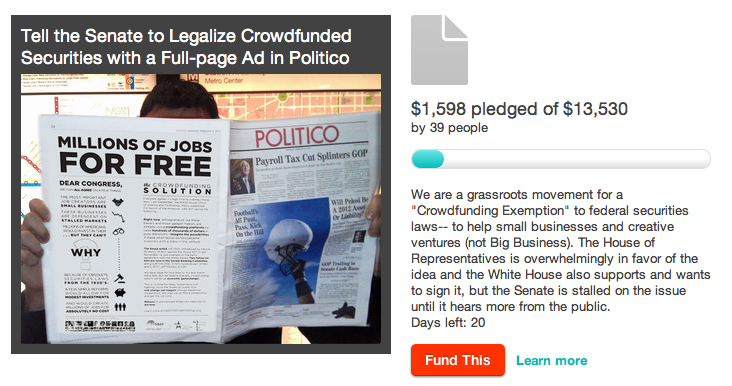 Politico is seen by 32,000 eyes in DC so let’s show all those folks working on Capitol Hill how Crowdfund Investing Equals JOBS. Fund the fight: None of this is happening for free. If you haven’t yet, please donate $50 to help us get this legislation across the finish line! Every $50 donation will get your name listed in the ‘I support Legalizing Crowdfunding’ section of the website. 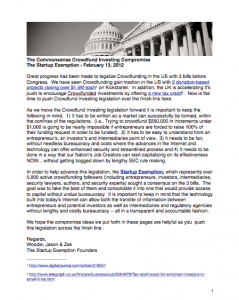 Great progress has been made to legalize Crowdfunding in the US with 3 bills before Congress. We have seen Crowdfunding gain traction in the US with 2 donation-based projects raising over $1.5M each on Kickstarter. In addition, the UK is accelerating it’s push to encourage Crowdfunded Investments by offering a new tax credit. Now is the time to push Crowdfund Investing legislation over the finish line here. As we move the Crowdfund Investing legislation forward it is important to keep the following in mind. 1) It has to be written so a market can successfully be formed, within the confines of the regulations. (i.e., Trying to crowdfund $250,000 in increments under $1,000 is going to be nearly impossible if entrepreneurs are forced to raise 100% of their funding request in order to be funded). 2) It has to be easy to understand from an entrepreneur’s, an investor’s and intermediaries point of view. 3) It needs to be fair, without needless bureaucracy and costs where the advances in the Internet and technology can offer enhanced security and streamlined process and 4) It needs to be done in a way that our Nation’s Job Creators can start capitalizing on its effectiveness NOW… without getting bogged down by lengthy SEC rule making. 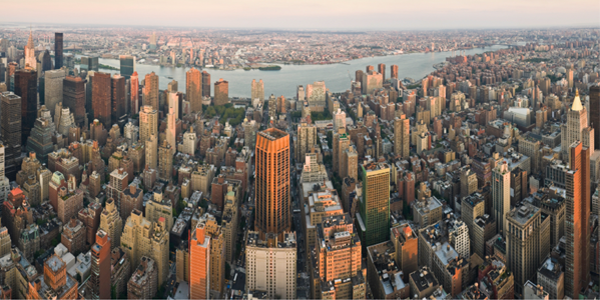 In order to help advance this legislation, the Startup Exemption,which represents over 5,000 active crowdfunding followers (including entrepreneurs, investors, intermediaries, security lawyers, authors, and security experts) sought a consensus on the 3 bills. The goal was to take the best of them and consolidate it into one that would provide access to capital without undue bureaucracy. It is important to keep in mind that the technology built into today’s Internet can allow both the transfer of information between entrepreneurs and potential investors as well as intermediaries and regulatory agencies without lengthy and costly bureaucracy — all in a transparent and accountable fashion. We hope the compromise ideas (click here for the full PDF) we put forth in these pages are helpful as you push this legislation across the finish line. Sherwood Neiss, Chief Advocate of the Startup Exemption testifies September 15, 2001 in front of a Congressional Committee on the ways in which we can get capital flowing to entrepreneurs, spur innovation & create over 500,000 companies and 1.5M net new jobs over the next 5 years. 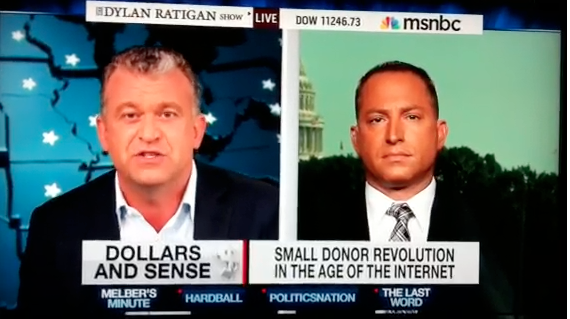 On September 14, 2011, Dylan Ratigan interviewed Startup Exemption Chief Advocate, Sherwood Neiss. 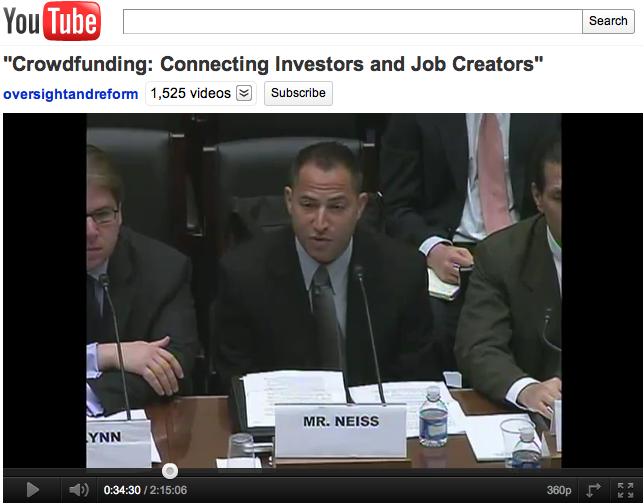 The interview took place in advance of the 9:30am hearing on September 15th on Capitol Hill regarding Crowdfund Investing. Sherwood spoke to Dylan about the importance of young businesses asjob creators, the need for capital to help fund these companies and how the Startup Exemption is a framework under which the SEC can allow equity-based crowdfunding to take place. Sherwood discussed how under the Startup Exemption framework entrepreneurs that pass the muster of the crowd can raise equity capital. How the model accounts for investor protection and how by working together not only can we get capital flowing but we can help those entrepreneurs with the best ideas succeed. The Startup Exemption was just endorsed in President Obama’s American Jobs Act and it has been promoted by Republican leaders of Congress as a way to promote business and capital formation for our nation’s net job creators. The framework for the Startup Exemption has the ability to create 500,000 new companies over the next 5 years employing over 1.5M Americans. 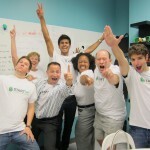 Obama Evokes the Startup Exemption in American Jobs Act! Last night President Obama delivered a speech to the nation in front of both houses of Congress. During his speech he laid out his plan to create jobs and jumpstart our economy. Today his Jobs Act was released with the following paragraph pursuant to his speech. 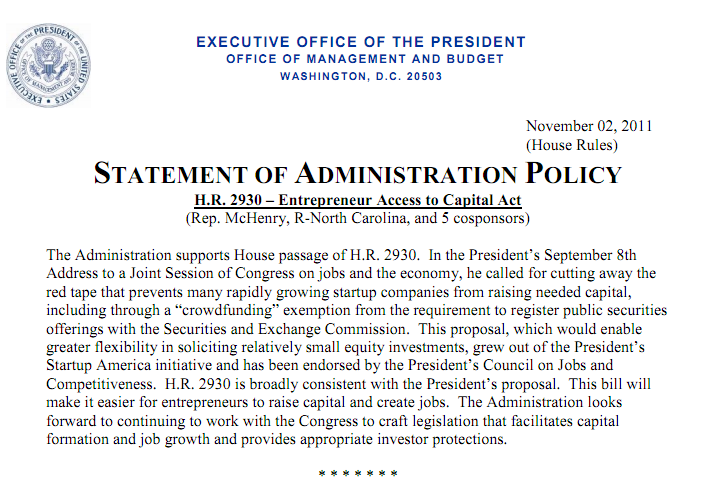 Reducing Regulatory Burdens on Small Business Capital Formation: As part of the President’s Startup America initiative, the Administration will pursue efforts to reduce the regulatory burdens on small business capital formation in ways that are consistent with investor protection. This includes working with the SEC to explore ways to address the costs that small and new firms face in complying with Sarbanes-Oxley disclosure and auditing requirements. The administration also supports establishing a “crowdfunding” exemption from SEC registration requirements for firms raising less than $1 million (with individual investments limited to $10,000 or 10% of investors’ annual income) …. This will make it easier for entrepreneurs to raise capital and create jobs. President Obama is pushing congress to enact the Jobs Act. 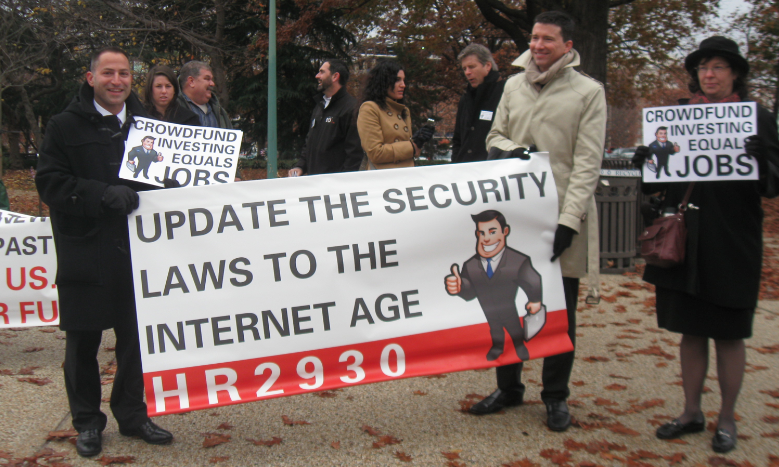 If passed, the crowdfunding changes advocated by the Startup Exemption will be the first changes to the security laws in the past 20 years. 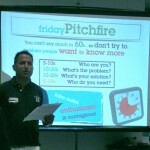 On May 20th Sherwood Neiss, Chief Advocate for The Startup Exemption decided to test the basis for Crowd Fund Investing by pitching the idea to approximately 150 people at Startup Weekend Miami. 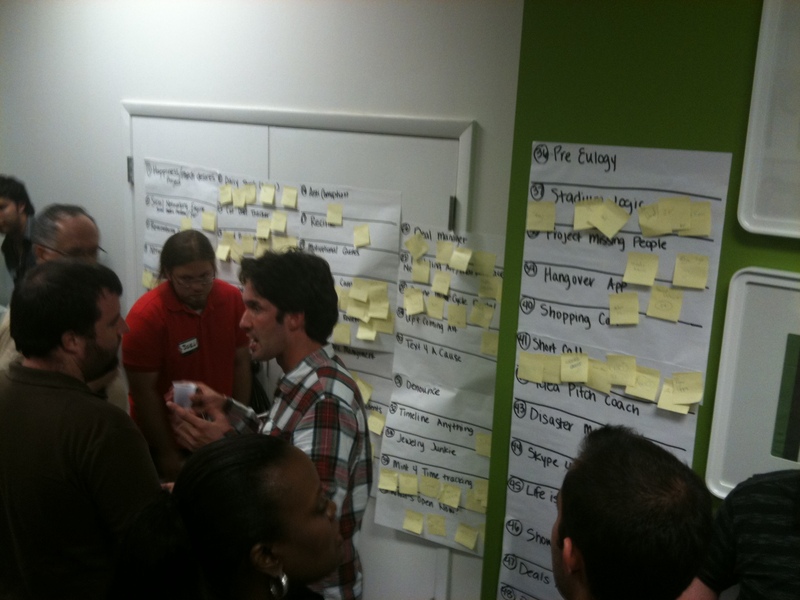 Startup Weekend (funded by the Kauffman Foundation – American’s largest Entrepreneurial Foundation) is a 54-hour event that takes place in 100 cities around the world. It is designed to provide superior experiential education for technical and non-technical entrepreneurs. The weekend events that have launched over 2,000 businesses, are centered on action, innovation, and education. 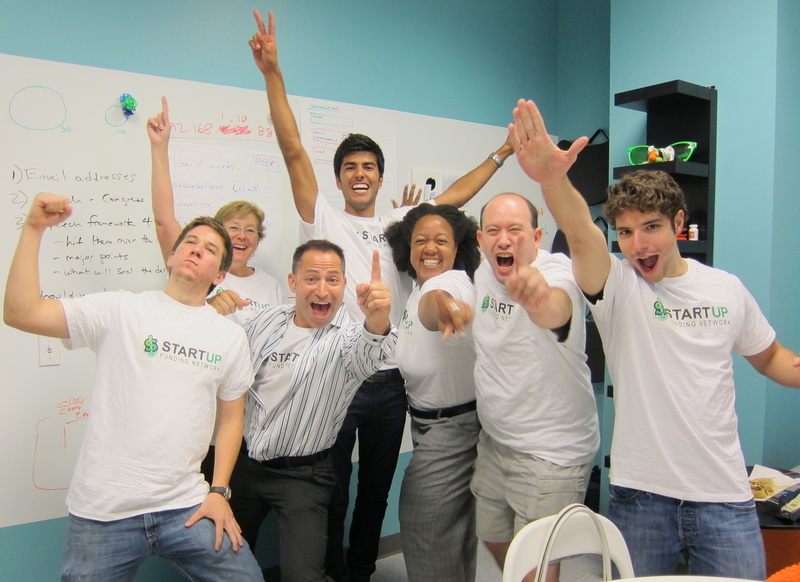 Beginning with Friday night pitches and continuing through testing, business model development, and basic prototype creation, Startup Weekends culminate in Sunday night demos to a panel of potential investors, experts and local entrepreneurs. Participants are challenged with building functional startups during the event and are able to collaborate with like-minded individuals outside of their daily networks. 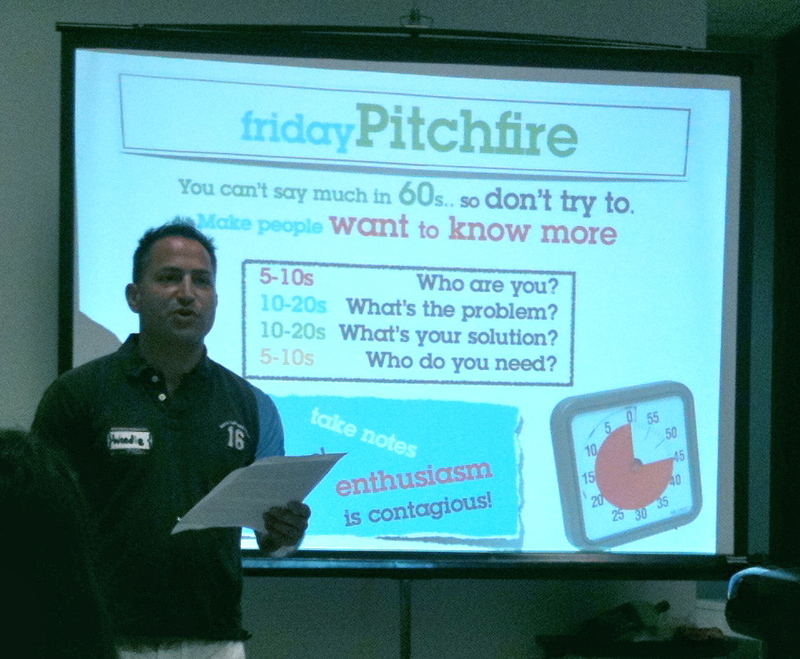 There were 60 ideas pitched by the attendees and the crowd voted. Crowd Fund Investing received the 4th highest number of votes. 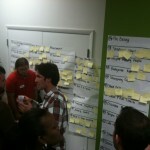 The Top 15 ideas formed teams and started working on their prototypes for the next 50 hours. Neiss’ team consisted of students; front and back end web developers, and business people. They divided the work into functional groups and by Sunday had a Minimum Value Proposition “MVP” to present to the judges. Neiss’ presentation began by congratulating to all the finalists with a reminder that while great ideas are sparked at this event, no one would go very far without funding. And that’s where their idea came in. With only 5 minutes to explain and demonstrate their proof of concept, Neiss was able to win over the 5 industry experts and VC judges. Winning comes with a variety of prizes that include a month of free social media support and 3 months of free office space at a Miami incubator. With 3rd party validation about the business model, Neiss will be using this as further evidence that the time is ripe for the SEC to update the Security Laws to include an exemption based on the framework in The Startup Exemption.